1. 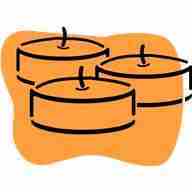 Place your candle just behind round/cylinder container/object. This could be a large soda bottle. 3. Blow against the round container from the front and at candlelight level. This works the same with liquids. The fluid or air tends to flow (follow) the contour of the round container. When the flow of air meets on the other side of the container, they join together to blow out the candle.